Okay, blogging girlfriends... I've got a wee bit of a story to share with you today. It's one that had me and my sister laughing the other day. It's my hope that, at the very least, it makes you chuckle. Because I do know sometimes you just gotta be there for it to be as funny. My youngest sister and her husband went on a short, but lovely winter holiday to Turks & Caicos Islands some months ago. 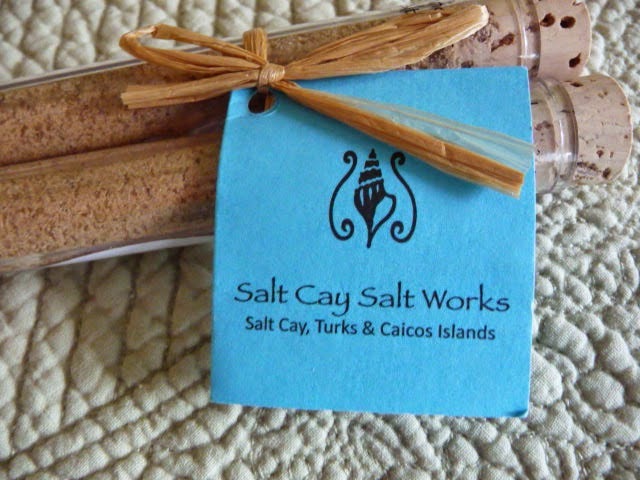 She'd brought back little souvenirs for the family -- including these little glass tubes with hand-raked sea salt from Salt Cay. Truth be told, I thought they were bath salts and so I tucked the package into my basket by the tub to use in a future soak. Then one day some weeks later my other sister -- who also got a set -- asked me if I knew what to do with the salt we got from Sis Janny. I replied, I think they're bath salts. Ah, she replies. And proceeded put her unopened package by her tub for a future soak. We thought it was all solved, but her question raised a little flag in my mind. I have been known to ignore little flags, to my chagrin, but this time I thought I'm going to check for sure. Are they really bath salts? So I read all the labels, including the back of the blue label, looking for clues as to their suggested use. There was nothing. 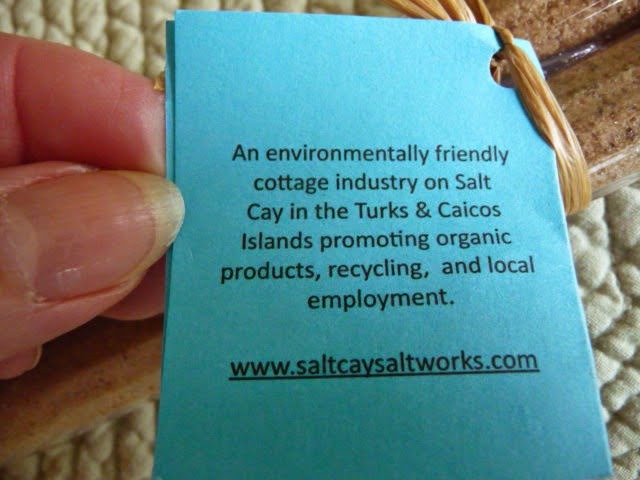 Interesting tidbits about it providing a cottage industry on the islands and the promotion of organic products. And, that they were hand-raked, but, alas, no indication as to use. Nada. And then that's when I saw it...... the hardly noticeable black ink label printed on the glass tube where it blended in with the mottled marks on the cork top. It was a little hard to photograph the whole thing, but can you see what it says? 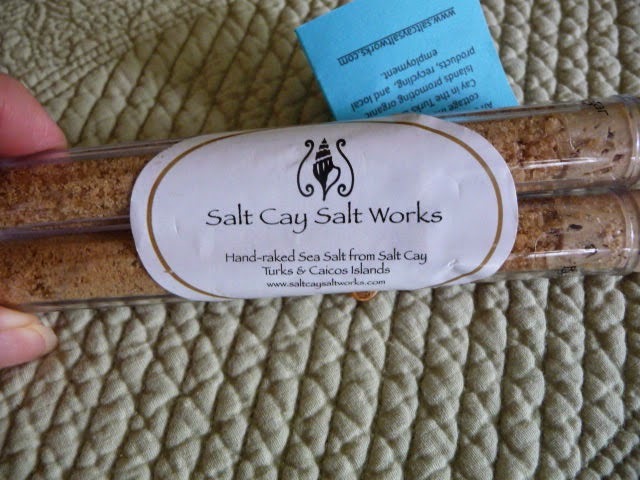 Oi oi.... they're not bath salts, but salt mixed with balsamic vinegar... for cooking! 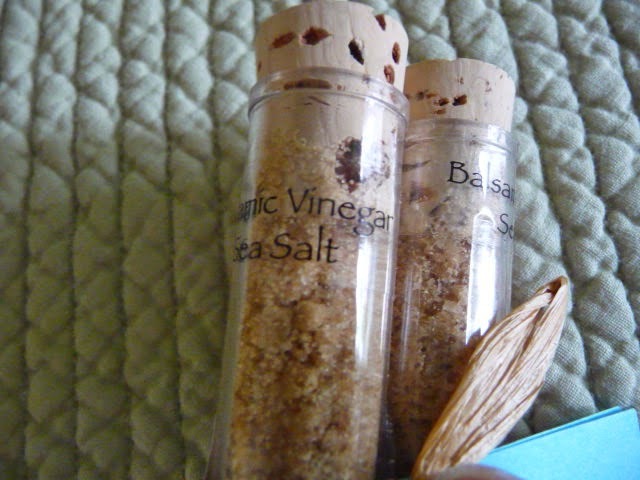 When I took out the cork, there was a lovely salt and vinegar fragrance that wafted past my nose. 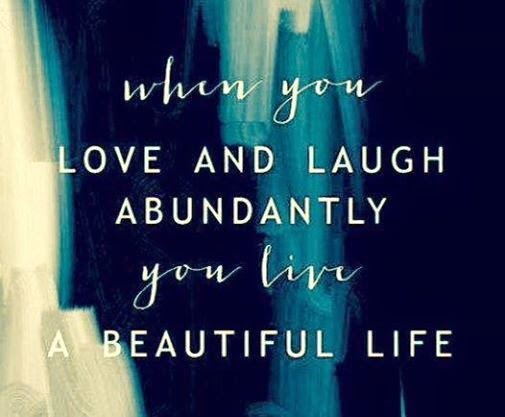 I reached for the phone because I knew Sister and I would have a great laugh imaging the possibilities of our responses if we had, indeed, poured those salts into our bath water. Nether regions would have been pickled, brined, and we'd have come out smelling like salad. Got any funny little stories of your own to share? It would have been worth the chortle we had, to have a had a Sundried Tomato bath! But as it is, I've restored the little containers to their place in the kitchen, and they continue to remind me of our dearest younger sister. Glad that you got it figured out in time! 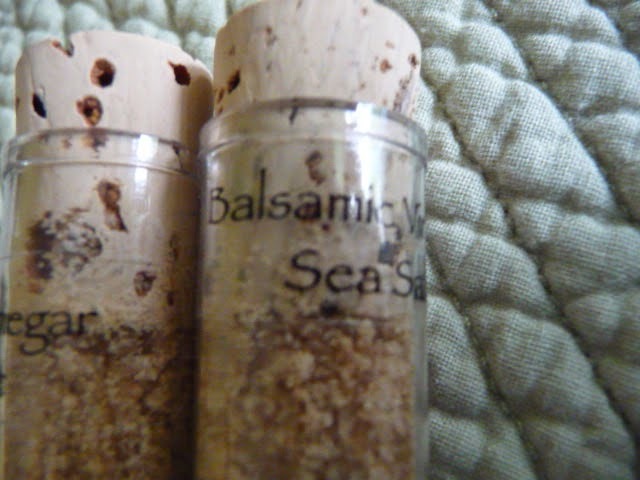 Balsamic sea salt is a terrible thing to waste! Great story, Brenda! Glad you found out before dumping the whole lot into the tub. Hee hee... that is too funny! What's With The Red Socks?